Every city in San Diego County experienced a growth in the Latino voter base this year, but none more so than San Marcos, Vista and Escondido. 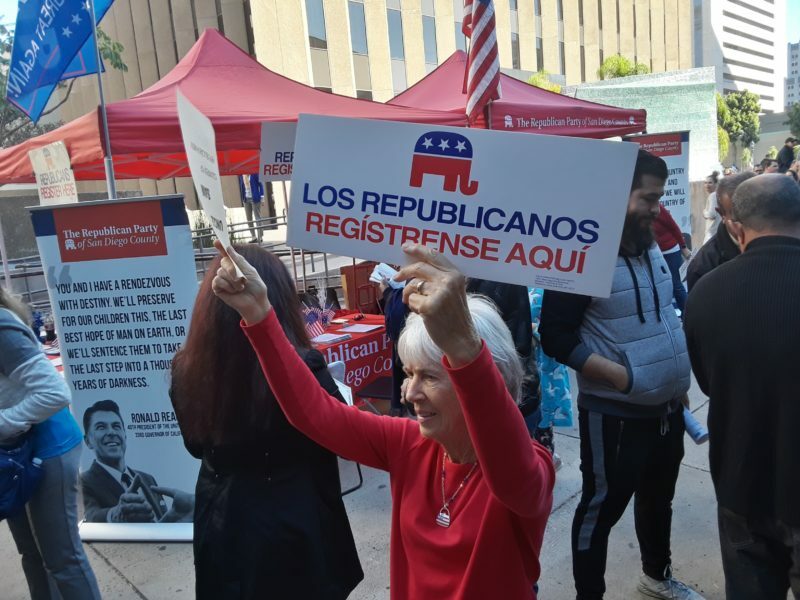 As a voting bloc, San Diego County’s Latino citizens may typically side at the ballot box with Democrats but they overwhelmingly registered to vote in 2018 as independents. Given the attention around district-based elections and the ousting of Escondido Mayor Sam Abed, a Trump acolyte, I pulled the last year’s data to get a sense of how important the Latino vote really was in November. I was surprised by what I found. 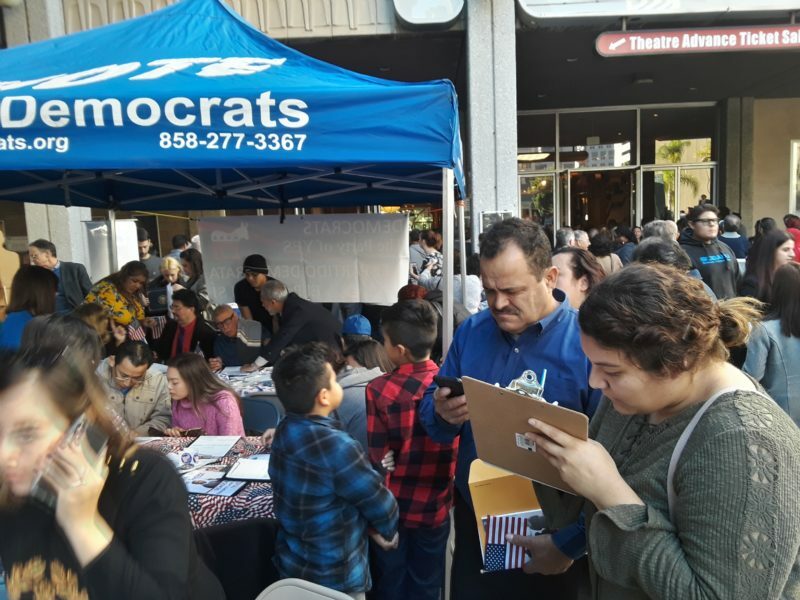 Between January and December, more than 28,000 people who qualify as Latino in the eyes of election officials — because they requested Spanish-language materials or were born in a Spanish-speaking country or their surname appears on a list provided by the Department of Justice — registered to vote in San Diego County. About 1,200 of those folks registered Republicans. Nearly one-fifth enlisted as Democrats. And a whopping 69 percent chose the no-party-preference label. To be clear, there are still more Latino Democrats than Latino independents throughout the region — 176,993 to 135,838. But the gap is closing, and it mirrors a demographic shift across California. No party preference is now the second largest voting group, and the fastest growing. Every city in San Diego County experienced a growth in the Latino voter base this year, but none more so than San Marcos, Vista and Escondido. Countywide, the Latino voter roll grew by an average of 8 percent, but those inland North County cities saw increases of 10 to 11 percent. The unincorporated areas grew by 9.5 percent. These communities were motivated in large part by the election of President Donald Trump, and the Democratic victories in traditionally conservative places should be viewed as a repudiation of his policies. Republicans actually lost Latino voters in Coronado and Encinitas in 2018. Still, a closer look at the voter registration data would suggest that the GOP isn’t necessarily lost to those same communities so long as Trump is the party’s standard bearer. An older generation viewed President Ronald Reagan favorably because of his amnesty work in the 1980s. Benjamin Martinez, an Escondido activist, registered to vote this year as a Democrat but considers himself an independent. He stays within the party’s structure because he feels that’s the best way to affect change, but he doesn’t fault other Latinos who view the entire system with skepticism. He primarily blames the “corporate Democrats” who help elevate businesses above the working class. Because there remain some shared ideals across the two-party divide, Martinez said, Latino voters — like any other demographic — will look to the candidates who “speak to them and work for them,” regardless of party affiliation. Lilian Serrano, a research coordinator at the National Latino Research Center in San Marcos, said people just don’t want to be associated with a group that they don’t totally understand. And that not understanding stems from a lack of outreach in Latino communities, a lack of campaign literature in Spanish and the perception of immigrants as single-issue voters. “We’re more complex than that,” she said. Maria Nunez, an attorney, won a seat on the San Marco City Council’s District 1 as an independent. Without party support, she ran a truly grassroots effort. But convincing her neighbors that she had their best interests at heart took some serious work. She did it by reminding, and in some cases teaching, those neighbors that the City Council seat is non-partisan. When talking to the people concerned that she wasn’t registered as a Democrat, she relied on her experience (and emphasized that she wasn’t a fan of Trump). A San Diego County Superior Court judge temporarily suspended an Encinitas law that gave voters final say over land-use decisions and prevented the city from putting a state-mandated plan in place for affordable housing. That plan was technically due in 2013. The new court-ordered deadline is April 11. But the plan first needs to go to the California Department of Housing and Community Development for review, a process that could take as long as 45 days. That means the city is long past the point of creating a housing plan from scratch. Instead, the City Council decided last week to submit to state regulators the housing plan that was rejected by Encinitas voters in November as part of Measure U, with some minor tweaks. There was also a quick discussion last week about costs. Various interests for developers and low-income tenants have sued to get a housing plan on the books. They didn’t get everything they wanted, but the judge’s favorable ruling means Encinitas is now exposed to outside attorneys’ fees. The city’s own defense has cost more than $1 million. The first few days of a state legislator’s job mirror a lot of others. There’s an orientation, with the same old insurance and HR forms, plus meetings with new coworkers. And then, you know, the task of representing some 400,000 people really begins. Last week, I caught up with Assemblywoman Tasha Boerner Horvath, the newly elected assemblywoman for the 76th District, about what she’s been doing in recent days and what the public should expect from her in the coming months. We briefly talked policy, and two things stuck out to me. First, she expressed a vision of development that’s becoming increasingly common among Democrats in coastal North County. They want to incentivize more affordable housing, on the other hand, but express skepticism over where it should go.